165 Jalan Ampang, Kuala Lumpur. Brunch is served from noon to 3.00pm, Sunday only. SUNDAY is a family day for most. Many make up for their busy week to spend quality time with their loved ones on this day and good food always makes great accompaniment for building relationships. Acknowledging the importance of family time on a Sunday, Intercontinental Kuala Lumpur has come up with a family friendly Sunday brunch setting at Serena Brasserie, which has something to offer to all ages. Aptly called Sparkalite, it refers to the free flow of sparkling wines and beer that will be served throughout the brunch, an option for those who love to wine and dine. 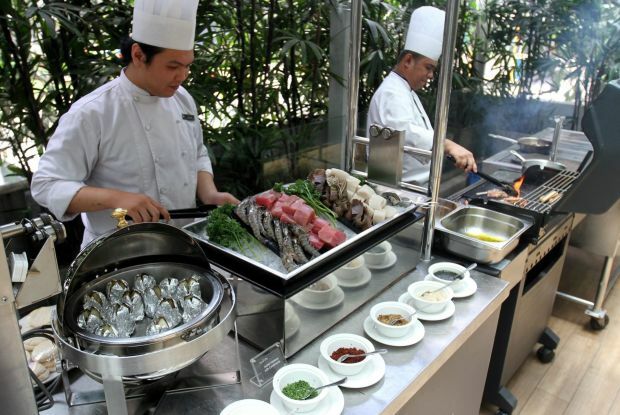 The food selection have an Australian feel to it with the wide selection of Australian barbecued items at its outdoor live action stations which goes very well with the drinks. There is Bruce’s Australian Barbecue station offering a selection of sirloin, lamb chops, sausages, baby chicken, tiger prawns, marinated tuna steaks, white fish and slipper lobster that would be grilled fresh when ordered. Delectable surprise: The Peking duck along with its condiments a hit with the guests. There is also the traditional roast beef at the carvery corner. Guests can also get creative and literally “build your own burgers” of mini Angus beef sliders or mini chicken satay sliders with a choice of condiments such as BBQ sauce, tomato chutney, caramelised onion marmalade, beetroot relish, cucumber and coleslaw. 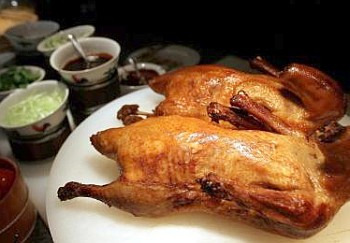 There was also an unlikely item on the buffet line — the Peking duck, which was a hit with the guests. The succulent meat with condiments such as cucumber sticks and other vegetables wrapped in thin pancake with special sauce was indeed mouth-watering. While all these and more are being savoured by the adults, children would have become restless the moment their stomach gets filled. To allow the adults to continue indulging their appetite, a colourful Kids Corner is set up with a candy station, popcorn station and a movie screening area. At 1pm, entertainers such as caricature artists and balloon-making artists will be there to keep the children occupied. There will also be activities like colouring and lamington-making that the children can take part in. For those who still prefer to have Asian cuisine, there is briyani rice and a choice of gravy — lamb, chicken and fish — or they can choose a serving from the variety of laksa at the Uncle Laksa Station. On top of that, there are a variety of seafood and sushis to choose from. A selection of saled such as crab and apple, balmain bug and orange, spiced chargrilled lamb salad and potato and spring onion salad is also available. As for dessert, much worthy of mention is the Rocky Road which full of nuts, chocolates and marshmellows packed in a small cube. There are also lamingtons, mini pavlovas, mini fruit trifles, banana and caramel sticky pudding and chocolate fudge brownie. Sparkalite is priced at RM120++ per adult (brunch buffet), RM60 per child (aged six until 12) and RM198++ per adult (brunch buffet, free flow of sparkling red and white wines and beer).